Be prepared. If you use your Mac to run a business or another activity where you can’t afford to lose productivity, do not upgrade to Mojave until you’ve made plans to fully recover your previous configuration if things don’t work out. For example, have a complete system backup that you know how to restore. Check both your hardware and software. Before you upgrade, remember to check Mojave compatibility for everything installed on or connected to your computer. Especially anything that depends on driver software. That could include printers, graphics tablets, scanners, cameras, networking equipment, calibration equipment, backup software, diagnostic software, adapters, hubs, docks, and so on. For example, I have not yet upgraded my production system to Mojave because my aging Wacom graphics tablet doesn’t work in Mojave (even though it still works great in macOS 10.13 High Sierra). Wacom will not develop Mojave-compatible driver software for my tablet, so I’ll have to buy a new one before I upgrade macOS. 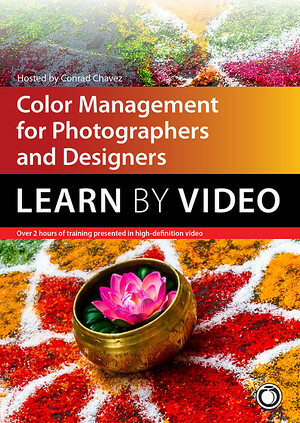 Test your complete workflow. Published compatibility reports may be on test systems that don’t have the same hardware and software you use. If you must ensure complete compatibility with everything you use, run your own tests with macOS 10.14 Mojave on a separate system, such as an external hard drive with a Mojave test system installed. If you have a Mac Pro with an NVIDIA graphics card and you want to take advantage of CUDA graphics acceleration, CUDA is not currently supported in macOS 10.14 Mojave. You should stay on macOS 10.13 or earlier. This is stated by NVIDIA in their document CUDA 10 and macOS 10.14. Adobe echoes the CUDA incompatibility with Mojave in their document Important Information on GPU and GPU Driver Requirements, while also advising that if you want the best performance out of Apple Metal graphics acceleration in Adobe video and audio tools, you should use macOS 10.13 or later. If you have a Mac Pro and need to get a new graphics card that supports Apple Metal in Mojave, macvidcards.com may provide some options. I focus on information that’s direct from Adobe, and on verified reports. To make the best use of your time and mine, I don’t repeat rumors and random anecdotes. But I do mention my own experiences. Good news: Adobe started publishing Mojave compatibility information earlier than in previous macOS releases. I was able to start updating the list below on the same day Mojave was released, which is unusual and welcome. Expect this section to be updated over time as we find out more about other applications and emerging issues; check back for updates. The Adobe help document macOS 10.14 Mojave compatibility FAQ | Creative Cloud answers several questions and links to some product-specific information. The Adobe help document Photoshop and Mojave | macOS 10.14 lists several issues. If you’re experiencing odd problems or crashes even with the most current version of Photoshop, try the accessibility permissions workaround in that document. A thread on the Adobe Photoshop user forums discusses a potential issue where Photoshop triggers a macOS request to access your contacts and calendar when starting Photoshop. This may be related to the more stringent macOS permissions security in Mojave discussed above. Victoria “Lightroom Queen” Bampton summarizes compatibility in her blog post Lightroom and macOS Mojave Compatibility. From a comment on that page, I learned that Lightroom Classic CC may crash in Mojave when switching in and out of Dark Mode. If Adobe InDesign CC 2018 and InCopy CC 2018 crash on launch in macOS 10.14 Mojave, it may be a plug-in incompatibility that can be fixed with a plug-in replacement script (see the Adobe help document InDesign/InCopy CC 2018 crashes on launch | macOS 10.14 (Mojave) beta). The help document refers to the beta version of Mojave; this may work differently in the final version. The Adobe help document Acrobat and macOS Mojave 10.14 compatibility describes several issues. Note: For now, the information below is mostly based on High Sierra and earlier, but none of it is expected to work better in Mojave. I will update this section after I have time to try installing old versions on the final public release of macOS 10.14 Mojave. Adobe software older than the Creative Cloud (CC) versions are not officially supported on macOS 10.14 Mojave. That doesn’t necessarily mean they won’t work; it just means that if those old versions have any new issues related to macOS 10.14 Mojave, there won’t be any updates to address them (in other words, the only version with the Mojave fixes will be the current version). Based on how Adobe CS3–CS6 applications have run in other recent versions of macOS, it’s safe to say that they won’t run as smoothly as they did in earlier versions of macOS/OS X. The CS3–CS5 applications seem particularly risky to me. There are more hoops to jump through to get the installers to work, and some installers may not work at all. Adobe doesn’t verify compatibility of older (pre-Creative Cloud) software because covering all of the features for multiple older versions would require extensive testing, and they were tuned for macOS code that has either changed dramatically or in some cases is simply not there any more. If you still depend on those old versions for serious production or need information about a specific feature (especially “does it work with my printer/tablet/scanner etc.”), you need to set up a test system to verify your workflow on Mojave before upgrading your production system (see How to test macOS 10.14 Mojave yourself). And if your tests determine that your programs won’t run well under Mojave but you want to upgrade, consider maintaining a system on a spare hard drive or partition just to run an older version of macOS for those applications. Many older applications have problems in Mojave simply because over the years, Apple has changed so much of the code in OS X/macOS. Even Apple’s own professional software is affected; older versions of Apple Final Cut Pro, Motion, Compressor, Logic Pro, and MainStage won’t run in macOS 10.13 High Sierra or later (see About Apple Pro Apps and macOS High Sierra). With that in mind, here are some notes about getting older Adobe software to run in Mojave. As in Sierra and earlier, older Adobe applications are able to launch only after you run the Apple installer for Java for OS X 2015-001. If you see the alert below, clicking More Info takes you directly to the Apple download page for that software. Java for OS X 2015-001 isn’t the most current version of Java for Mac, so be aware that installing it may introduce incompatibilities or security vulnerabilities. Be prepared to uninstall and reinstall if needed. 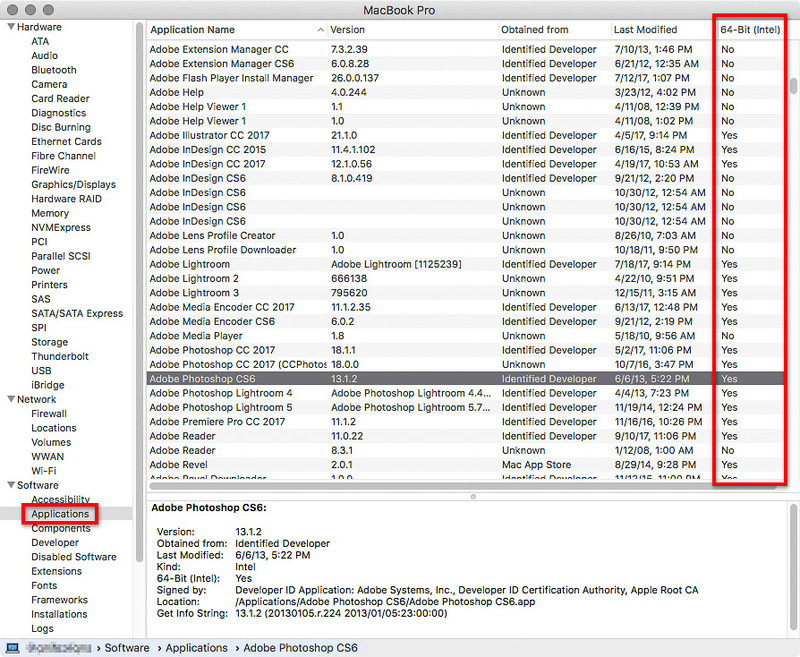 Some older Adobe applications may have licensing errors after a Mac system upgrade. It may be possible to fix them by uninstalling and reinstalling those applications. The lesson here is to always make sure you have all of the information you need (such as license keys or registration numbers) to reinstall any of your key software. You may also need to reset Adobe licensing files on your Mac (see Registration servers, update servers, and activation servers below). If you can’t find your old Adobe installers, you may be able to download them from a page on the Adobe web site (Adobe software and other downloads) which has links to many older versions of Adobe Creative Suite applications such as Photoshop and Illustrator, along with Lightroom and more. Stricter macOS permissions may cause crash when starting an application. There are reports that some applications such as Photoshop CS5 crash when you try to run them in macOS 10.14 Mojave. Macworld UK reports that a fix is to grant accessibility permissions to Photoshop. Right-click (or Control-click) the installer and choose Show Package Contents. In the Install window that opens in the Finder, go to the Contents/MacOS folder, and in there, double-click Install. That will open the Terminal application, some lines of code will automatically run, and the actual Installer should successfully launch. Make a note of this workaround, because any pre-CC installers are unlikely to be updated. The error message is documented in an Adobe help page: Installing Creative Suite on macOS 10.12 (Sierra). But I found that the same workaround helped when the Photoshop CS3 installer silently failed after I double-clicked it. Registration servers, update servers, and activation servers. If you get a message saying that a registration or update server is not available in an old Adobe application, that won’t stop the application itself from working so it’s not much of a concern. However, being unable to reach an activation server may keep an application in a trial period with an expiration date. If you’re trying to install a CS3 application, you will probably need to get a new serial number that doesn’t require activation, because Adobe retired the activation server. You can get that at this Adobe page: Activation or connection error | CS3, Acrobat 8. For help with Adobe licensing and activation problems, see the Adobe help pages Activation and deactivation troubleshooting and Troubleshoot activation limit reached or sign-in failed errors. When you start up an older 32-bit application such as Adobe Photoshop CS3, Mojave will display the following alert saying the application is not optimized and needs to be updated. In High Sierra the alert appears only the first time you start the application, but in Mojave, Apple says it will also display every 30 days. The bottom line is, don’t be alarmed when you see it, because the application will still run (though not beyond Mojave). To understand what Apple is talking about, read the Apple tech note 32-bit app compatibility with macOS High Sierra 10.13.4 and later. Apple has said that Mojave is the last version of macOS that will run 32-bit applications. Most Mac applications have been written for 64-bit processing for some time now, so if your applications are up to date you may not have any issues here. But if you’ve been holding on to some old 32-bit applications for as long as possible, they may have issues in Mojave. Because Adobe software is generally performance-intensive, the current versions of major application are already 64-bit, but older ones and some Adobe utilities are still 32-bit. How do you know if you’re running 32-bit applications? Click the Apple menu, choose About This Mac, and click System Report. Now, in the System Information window that opens, click the Applications category, and then (after a slight delay on some systems) look for the 64-Bit (Intel) column. On smaller displays you might need to scroll the list to the right. To find out if all your software is 64-bit compatible, check the Applications section in System Information. macOS 10.14 Mojave has a new Dark Mode option, which applies a dark gray/black color scheme to the overall user interface instead of the traditional light gray/white palette. Applications have to be updated to appear consistent with Dark Mode, so older applications with light user interfaces will clash. 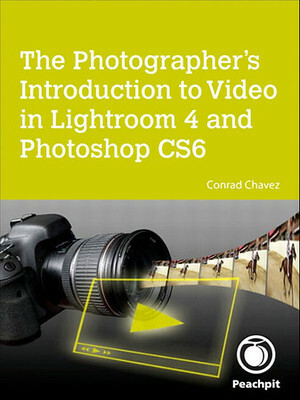 Some Adobe applications, such as the video applications and the more recent versions of Photoshop and InDesign, let you adjust the lightness of the user interface. If you use Dark Mode you can try a darker user interface setting in your Adobe applications, although they might not match completely. Over time we can expect future versions of Mac applications to match the Apple dark mode aesthetic more closely. Adobe has not said anything about this regarding their Mac applications. There is no way to run Adobe CS2 software on macOS 10.14 Mojave. The only option is to use a newer version of the software. The question of CS2 compatibility comes up during every recent Mac system upgrade. 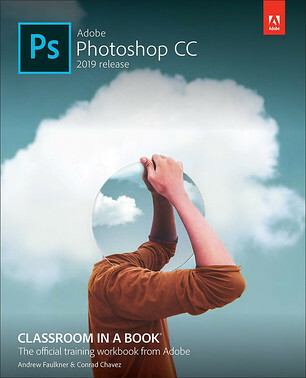 Some users moving up from older Macs running 10.6.8 or earlier to new Macs with the latest OS version may still be using the Creative Suite 2 (CS2) version of Adobe software, such as Adobe Photoshop CS2. As with the last several major Mac system upgrades, macOS 10.14 Mojave requires that software be written for the Intel processors that have been running Macs for over 10 years. But CS2 applications were written for the PowerPC processors that ran older Macs. The last version of Mac OS X to run PowerPC software was OS X 10.6.8 Snow Leopard. A few more changes in Mojave have potential implications for Adobe users. The file system is the part of the OS that keeps track of all your files. This is such a fundamental function that when that changes, there is great potential for big problems if the transition isn’t handled 100% properly. If your Mac is currently running macOS 10.13 High Sierra it’s probably already gone through the APFS transition, but if you’re upgrading from macOS 10.12 or earlier, the following will apply. Mojave is built on top of the new Apple File System (APFS), which is designed around security, reliability, and the ability to work across macOS, iOS, tvOS and watchOS. APFS will eventually replace the decades-old HFS+, but for now, Mojave can work with APFS or HFS+. If your Mac’s system volume is on a solid-state drive (SSD), the Mojave installer converts its file system to APFS; this is not optional. At this time, upgrading to Mojave will not convert system volumes based on hard drives or Fusion drives, but that’s expected to happen in a later release. I haven’t had obvious problems installing or using older Adobe software on the APFS volume that’s created by default. Some Adobe features that involve a folder or drive location (such as the scratch disk feature of older versions of Photoshop) may not work properly with APFS. Also, an Illustrator CC tech notes errors you may encounter related to APFS (Illustrator and High Sierra | macOS 10.13). If you have trouble using a feature that interacts with the file system, especially in an older version of an application, it could be related to an incompatibility with APFS. In macOS 10.13.4, Apple added support for external graphics processing units, called external GPUs or eGPUs. The idea is that you put a powerful graphics card inside a box and connect it to your Mac using Thunderbolt, and that upgrades the graphics capabilities of your Mac. Some applications may not support an eGPU automatically, so if there is an application that you’re especially interested in accelerating with an eGPU, contact the developer to see if their application fully supports an eGPU. At this time, Adobe doesn’t have much information about which Adobe applications official support an eGPU. Also, be aware that some eGPU solutions can accelerate only an external display. Wondering what Mojave is all about? For the most in-depth review you’ll probably find anywhere, read the macOS 10.14 Mojave review at Ars Technica. As with every major release of the Mac operating system, the Ars Technica review not only evaluates the visible features that Apple promotes, but goes under the surface to explain changes to some of the underlying technologies in macOS and how they affect your Mac experience. Since I originally wrote this article, my production Mac has remained on High Sierra. Current versions of Adobe applications are reported to be running well under Mojave, and with the release of macOS 10.14.2 in December 2018 I thought I might be ready to upgrade. But then I remembered that when I tested Mojave on a spare system drive, my Wacom tablet would not work and it’s so old that Wacom will not write Mojave-compatible driver software for it. I am postponing the upgrade to Mojave until I buy a new graphics tablet. I usually wait several months before using the latest version of macOS, so this is not an unusual delay for me. This article was originally posted on September 23, 2018 but is updated as new information emerges. Thank you for the helpful information. I just installed Mojave on my MacBook and Photoshop CS3 seems to work–so far so good. Would appreciate hearing from other users. More about Photoshop CS3: I have to install a legacy version of Java before CS3 would work. @Steve Clarke, do you also have Illustrator? Does it work also? Those two, Illu and Photoshop are my main applications I use from my CS3. Appalling! Upgraded to Mojave and now P/shop CS6 crashes when I try to run NIK software. Also, boot-up and wake from sleep are painfully slow, I’m having trouble with right-click file renaming, and thumbnails are sluggish or totally reluctant to show their .jpg file’s image. I should know better these day than to trust Apple’s updates. Nothing but grief. Thanks for your article. Adobe Premiere CS5 seems to not even open with Mojave, this means a lot of trouble for me. 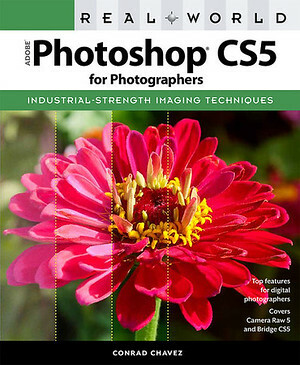 The rest of my CS5 (photoshop, illustrator and indesign) are working fine but not super smooth. Thank you so much for the help. I am using Adobe Illustrator CS6 under Mojave 10.14.2 thanks to your workaround for the “Installer Failed to initialize”. Thank you!